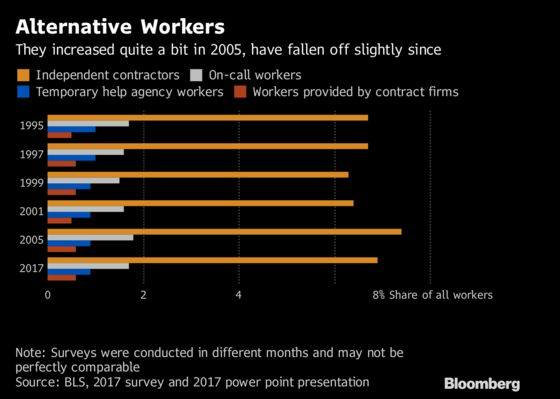 (Bloomberg) -- The share of American workers in the “gig economy” has shrunk since 2005, according to a government report that some data-watchers cautioned omits key parts of the picture. The Labor Department on Thursday said that 10.1 percent of American employees in May 2017 were on alternative work arrangements -- which includes independent contractors, on-call workers and people working for third-party contractors -- down from the 10.7 percent in the last report in 2005. That decline resulted mainly from a drop in the share of people identifying as independent contractors, which fell to 6.9 percent from 7.4 percent in 2005. The decline surprised some economists who expected a greater share for alternative work arrangements given the growth of ride-sharing services such as Uber and freelance labor connectors like TaskRabbit. The 2005 survey was taken before widespread use of smartphones, and before many of these startups were founded. The Labor Department asked similar questions as in 2005 in order to have comparable data. One explanation is that the government survey excluded those working one or more alternative jobs in addition to their main position. And the count also potentially overlooked independent contractors who use a phone application or an intermediary website to find work: The survey asked if the respondent worked in a job where they “obtain customers on their own to provide a product or service” -- a question that might exclude those who use an app like Uber. “It’s about the definition -- the definition here is a bit myopic, it’s a bit old,” said Michael Affronti, vice president of product at Fuze, a provider of communications services that ran its own survey of about 6,600 people on the marketplace for alternative labor. Affronti said a gig worker should be defined as anyone who works outside of a large company and who uses their skills and services -- encompassing freelancers, those with a gig on the side in addition to full-time work, and those using apps to find customers. Karen Kosanovich, a Labor Department economist in Washington, said the survey was “designed to replicate what we’ve done in the past,” adding that any constraints on the data are the same as in the prior report. Another estimate of alternative workers as a share of employment came in at 15.8 percent in late 2015, according to a 2016 paper by Harvard University’s Lawrence Katz and Alan Krueger of Princeton University, based on their own survey. Those using online intermediaries made up only 0.5 percent of workers. Katz said he and Krueger are updating their own survey results before year-end. The government’s data did show some revealing shifts. Americans age 55 and older constituted bigger shares of independent contractors in 2017 than in 2005. That suggests that aging Baby Boomers are accepting such positions, whether it be to supplement incomes or because they may be easier to take than traditional jobs. The labor-force participation rate among people 65 and older stood at 19.8 percent last month, compared with 15.2 percent in May 2005. Also, this segment of the labor market is looking up for women: female independent contractors’ median weekly earnings jumped 60 percent in the intervening period, compared to just 13 percent among men -- though men’s wages were still 22 percent higher. Such jobs still provide less support. People in alternative arrangements are less likely to be on employer-provided pensions or be covered under health insurance. Also, just over half of the contingent workers surveyed in 2017 said they would have preferred a full-time job, about the same level as in 2005. One more caveat surrounding the figures: Previous versions of the survey were conducted in February, rather than in May, which could influence the types of jobs available at different times of the year.